Walmart has fired the supplier that subcontracted work to a Bangladesh garment factory where at least 112 people died in a deadly fire on Saturday. The world’s largest retailer said that Tazreen Fashions was no longer authorized to produce merchandise for the company, but the supplier, which the company declined to identify, continued to fan out work there “in direct violation of [its] policies” anyway, according to Walmart spokesman Kevin Gardner in a statement on Tuesday. “Today, we have terminated the relationship with that supplier,” he said. Despite the company’s eagerness to distance itself from the country’s worst industrial disaster in history, however, labor activists claim that Walmart is no less culpable. Bangladesh’s garment industry, which is second only to China in terms of clothing exports, has a notoriously spotty fire-safety record. Since 2006, more than 500 Bangladeshi garment workers have perished in fires resulting from unsafe buildings, according to the Clean Clothes Campaign, an alliance of organizations in 15 European countries dedicated to improving working conditions in the global garment and sportswear industries. 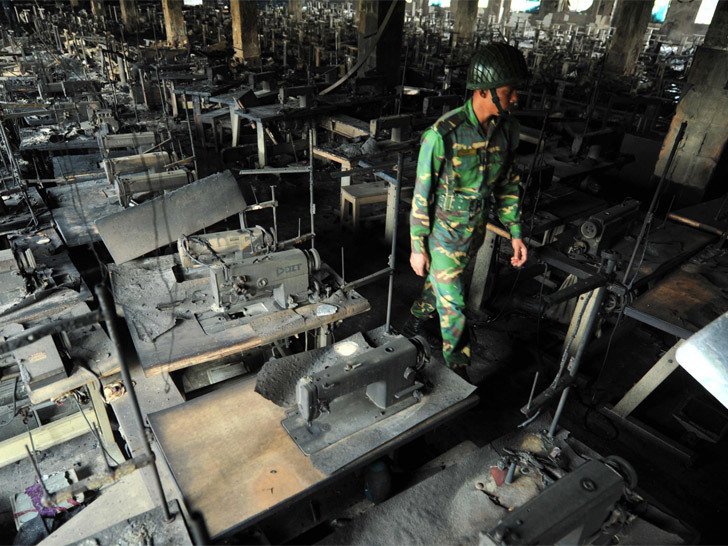 Bangladesh’s garment industry, which is second only to China in terms of clothing exports, has a notoriously spotty fire-safety record. Export data further indicates that Walmart is the second-largest buyer of garments from Bangladesh after H&M. In its 2012 Global Responsibility Report, the company said that “fire safety continues to be a key focus for brands and retailers sourcing from Bangladesh.” It also claimed to visit supplier factories, identifying those at “high risk for fire-safety hazards” and ending relationships with 49 factories in Bangladesh because of fire-safety issues in 2011. A document posted on Tazreen Fashions’ website indicated that an “ethical sourcing” official for Walmart had flagged the factory in May 2011 for unspecified “violations and/or conditions which were deemed to be high risk.” It was downgraded to “medium risk” that August. Although the factory was due an inspection within a year, it remains unclear if it was ever conducted. Labor-rights groups, including the Clean Clothes Campaign and the International Labor Rights Forum have struggled to develop a fire-safety program to prevent future deaths in Bangladesh’s garment industry. In March, PVH Corp., which owns Tommy Hilfiger, Calvin Klein, and IZOD, signed an agreement that includes independent inspections, public reporting, mandatory repairs and renovations, a central role for workers and unions in both oversight and implementation, supplier contracts with sufficient financing and adequate pricing, and a binding contract to make these commitments enforceable. Tchibo, a German retailer, signed on in September. Other brands implicated in factory fires in the past, including Abercrombie & Fitch, Gap, H&M, JCPenney, Kohl’s, Target, have also been invited to join the agreement, with mixed response. 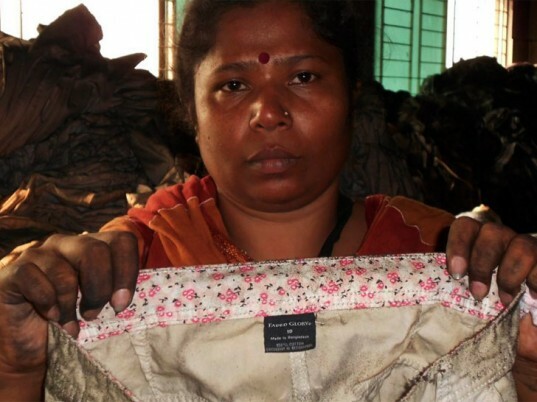 Statement by International Labor Rights Forum and Worker Rights Consortium: Apparel Brands Buying from Bangladesh Should Join the Independent Bangladesh Fire and Building Safety Agreement Walmart�s constant downward price pressure prevents factories from being able to afford necessary safety precautions and its own supply chain auditing has failed to protect workers from being killed in deadly fires. One factory producing Walmart�s Faded Glory clothing line, Tazreen Fashions, caught fire on November 24, 2012, killing 112 workers and injuring more than 200 workers in the deadliest factory fire ever in Bangladesh. According to Walmart, a supplier had subcontracted work to Tazreen Fashions without Walmart�s authorization. Regardless of whether Walmart acknowledges Tazreen as an approved supplier, Walmart is responsible for the safety of the workers making its clothing and should not abandon Tazreen and its employees following this disaster. Walmart must now provide full and fair compensation covering loss of future earnings as well as damages to the families of the dead as well as to the injured workers. In addition, to minimize the risk of future factory fires, Walmart should join the independent and comprehensive Bangladesh Fire and Building Safety Agreement with unions and labor rights groups that PVH (owner of Tommy Hilfiger and Calvin Klein) and German retailer Tchibo have already signed onto. The program includes independent inspections, public reporting, mandatory repairs and renovations, a central role for workers and unions in both oversight and implementation, supplier contracts with sufficient financing and adequate pricing, and a binding contract to make these commitments enforceable. Walmart has fired the supplier that subcontracted work to a Bangladesh garment factory where at least 112 people died in a deadly fire on Saturday. The world's largest retailer said that Tazreen Fashions was no longer authorized to produce merchandise for the company, but the supplier, which the company declined to identify, continued to fan out work there "in direct violation of [its] policies" anyway, according to Walmart spokesman Kevin Gardner in a statement on Tuesday. "Today, we have terminated the relationship with that supplier," he said. Despite the company's eagerness to distance itself from the country's worst industrial disaster in history, however, labor activists claim that Walmart is no less culpable.